This week's photo prompt was taken by Kurt Gordon, an Australian photographer who travels a lot and takes a lot of pictures. You can find them on display over on 500px. He has some stunning shots. This one was taken when he was on the 3rd day of the Inca trail. 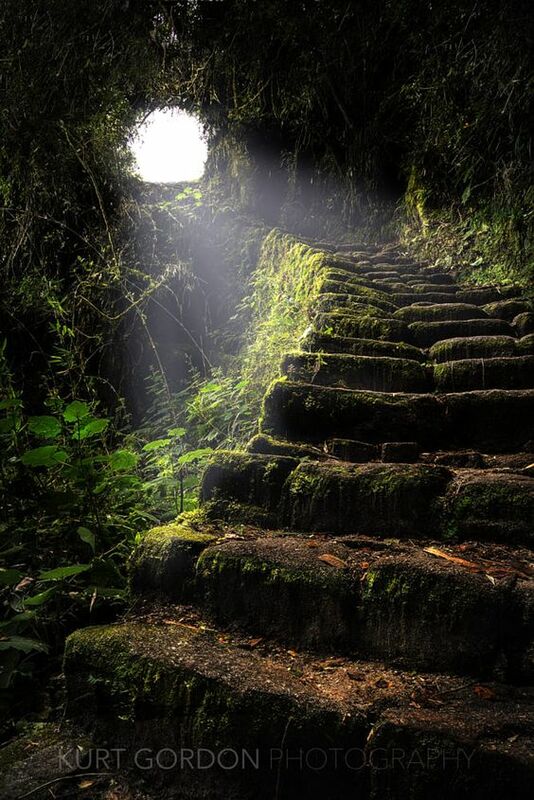 Simply called Stone Stairs. I tried to come up with something original, because initially all I came up with were cliche ideas for this photos. I like how it panned out. Abby could sit here forever admiring the view; the perfect glow of light coming in and colouring the world inside this beautiful cave. She’d been lucky to stumble upon it. She smirked – stumble being the operative word. She looked down at her crooked leg that had now gone numb in places (at least she hoped that was why she couldn’t feel all of it), and then down at the steps she’d managed to crawl up in the dark since her fall. In the dawn sunlight she could see how well crafted they were, and how they spiralled down into the cavernous green hollow. Abby also noted how the ground fell away steeply on one side of the stone staircase at the entrance, and reminded herself how lucky she’d been with how she’d fallen in. She’d been foolish to continue moving around at night on the dark mountain side. What had she been thinking? She’d been thinking about getting to the top first, that’s what she’d been thinking – like it was some kind of race completing this Inca trail. She’d missed the point entirely. She knew that now. They didn’t call it a pilgrimage for nothing. It was about the journey not the destination. All the clichés were starting to make sense now. She’d wanted a new challenge, a change of life, a change of self – and well she had certainly got that spending all night trying to pull her broken body up some mysterious steps. A part of her was in awe of the place that had come into view over the last hour, but another part of her knew she was still in shock from the accident. She had to get out of here while it lasted and try and find some help, because without it the chances of survival were slim. Abby wasn’t a natural survival type. She hadn’t taken a proper look at her leg – hadn’t dared. Mostly because she wouldn’t have a clue what to do to help it, but also because seeing it might send her into a panic. Panic would be her undoing right now. It was why she was focusing on the things she was grateful for, like how she’d fallen through the hole onto the steps rather than into the abyss beside them, and how beautiful the location was, something she wouldn’t have seen if she hadn’t fallen in. She’d survived the night by concentrating on climbing up the steps, one tiny bit by one tiny bit, the mental focus allowing her to push out the pain and all the other thoughts, and she would survive by continuing to do that. This reminded her of what she needed to do now. She could see the top. It wasn’t that far; she could even count the steps. She would make it out of here, she knew that, so she started again, dragging her body up each step, pushing the pain to the back of her mind, and resisting the urge to scream either in response to it or to attract attention. It would be a waste of energy. Relief overwhelmed her. She knew the light would lead her out of the darkness. A poem is perfect - especially this one! And don't worry, I will sort a clickable link. Thanks for joining, it is short but potent. I have put a clickable link in for others in the comments below. Saw the cave, and knew Armor 17 would show up this week. Love this concept. Could see this grow into something. Would love to read it. Thanks for joining.